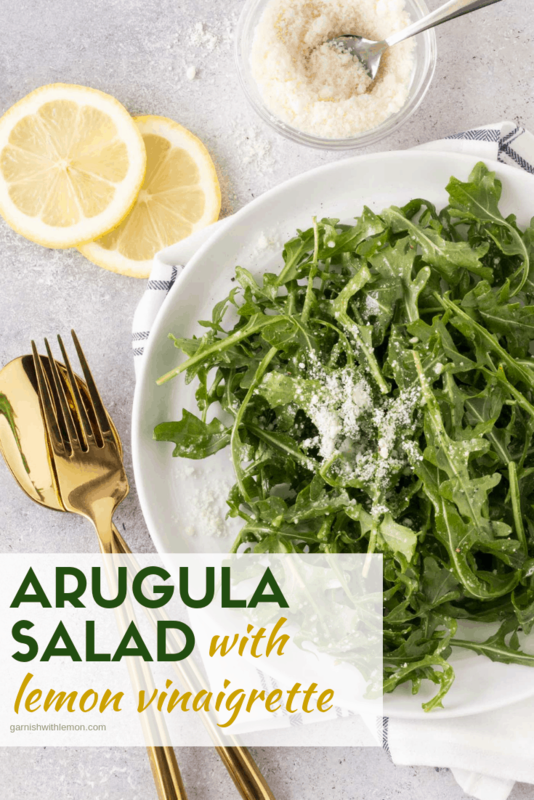 You won’t believe the flavor that is packed into this 5 ingredient Arugula Salad with Lemon Vinaigrette! Summertime seems to be made for salads, and this Arugula Salad with Lemon Vinaigrette makes a frequent appearance on our table mainly because it’s Kevin’s favorite. I find it kind of funny that a simple salad made with only 5 ingredients is something that he can’t quite get enough of, but you won’t hear me complaining! 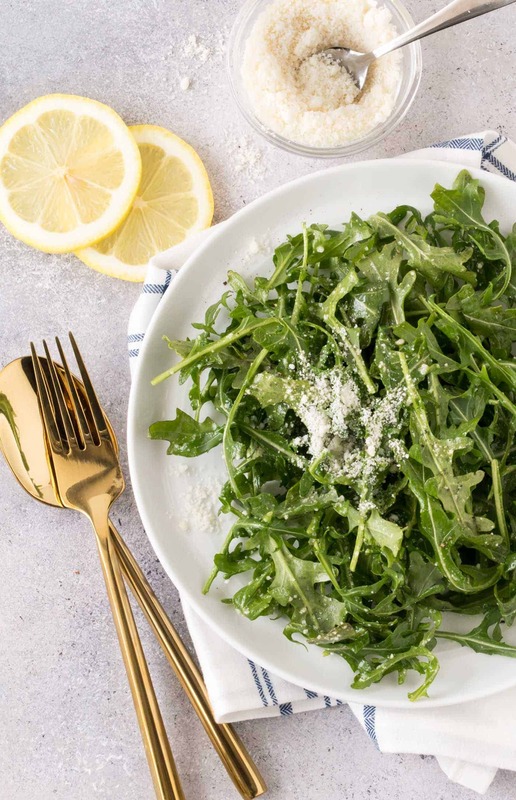 This Arugula Salad with Lemon Vinaigrette is just another reminder that keeping things simple is the best way to go. Does anyone else try these complex meals that take a ton of time and ingredients to put together and end up with a dinner that doesn’t have the wow factor it should for the amount of effort required? And then, to make matters worse, you have a ton of clean up to do. It has happened to me more than once, so this summer I am fully embracing the keep it simple motto. And really, with all of the fresh produce that is available during the summer months, there isn’t a reason to do anything complex. Not to mention, why waste time in the kitchen when you can capitalize on the great flavors readily available? 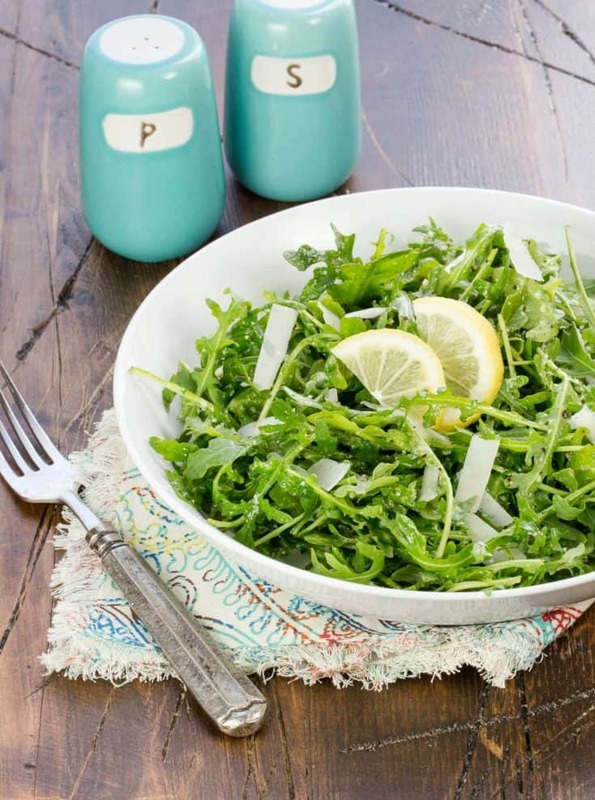 What makes this arugula salad so delicious? The complex flavor combinations! 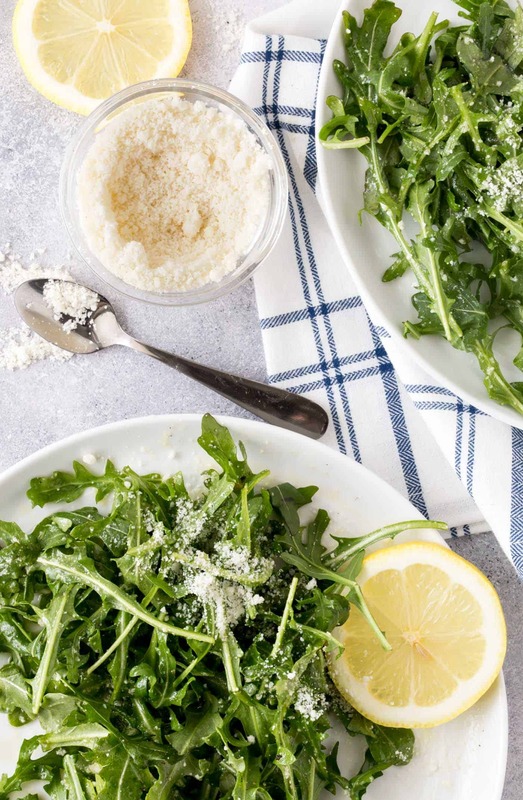 The peppery arugula is the perfect partner with the salty parmesan and tart lemon vinaigrette. So much flavor in each bite. Add some Maple Ginger Salmon, and you have a killer meal that took minutes to prepare and it’s healthy to boot. Sounds like a perfect (and delicious) way for me to stay true to my keep it simple motto. Tip: Need a good salad dressing shaker? I have this one and LOVE it! There can never be too many tasty ways to get your greens in! Place the lemon juice and white wine vinegar in a small bowl and whisk in olive oil to emulsify. Season to taste with salt and pepper. Place the arugula in a large bowl. Pour desired amount of dressing on top and toss to coat. Add grated Parmesan and toss to mix. Add shaved Parmesan to top and serve immediately. Toast some pine nuts and throw them in there as well. This salad (with pine nuts) is made at Tom Colicchio’s restaurant, CRAFT in NYC. Super delicious! What a great idea! I love pine nuts! This was fantastic. I’ve used just olive oil and lemon juice before and it was missing something. The white wine vinegar adds a lot. Great, simple recipe! SO glad you love it! It is one of our favorites! Made this over the weekend! It was so yummy and bright! Will be making it again at Christmas.